P.J. Harvey is the only musician to win the coveted Mercury prize twice. She is held in very high regard and an unusual degree of fondness in the hugely competitive music industry. Along with her artistic success, her eclectic original work and poetic vision has lead to her receiving an M.B.E, an honorary degree from Goldsmiths University and she has been a guest editor of BBC Radio’s Today programme. What may not be immediately obvious are her skills in leadership and the lessons that can be learned from her success. I had the enormous privilege of visiting PJ Harvey’s recent art installation at Somerset House a number of times in the last few weeks, and I have to say it was an exceptional experience. Its run has just now ended. As well as some very rich, treasured memories I came away from the event with valuable insights into my own field of expertise that I want to share. Her installation allows the public to witness the recording of her next album, the much-anticipated follow-up to Let England Shake. Up to 10 musicians and professionals along with PJ work in a small brightly-lit white box in the catacombs of Somerset House for ten hours a day for five weeks. Long-time musical collaborator John Parish along with Flood (producer) and others, all engage and focus on recording the album, to be released in early 2016. The audience attend for sessions of 50 minutes. We are outside the box looking in through one-way glass, hearing the activities via radio-mics. We are flies on the wall, not seen or heard by the group inside, who just get on with the business at hand. The first time I went was out of curiosity, with a total lack of knowledge of the recording process and no expectations. As well as hearing some superb musicianship what I got was a lesson in leadership, team building, emotional intelligence and how the best leadership lessons can be learned at places you least expect. I am a trainer working with the unconscious bias. I spend my work life researching, designing and delivering workshops on various aspects of leadership. Recently I worked in India with senior civil servants from Afghanistan. They were attending a two-week leadership programme on various aspects including Change Management, Talent Management, Leading People for High Performance, Conflict Management etc. I chose to deliver Emotional Intelligence in the workplace and insisted that it was the very first session delivered. Emotional Intelligence and being aware of your unconscious bias is the foundation stone upon which all other leadership lessons are built . If leaders get this right, all other areas are so much easier to understand. Standing outside that white box in Somerset House, I very quickly realised that what I was seeing was not just a recording of an album. This was a story of PJ Harvey using her emotional intelligence and giving us the viewers a lesson in the top qualities of outstanding leadership. Watching PJ Harvey, a diminutive woman working with her team of men, I could clearly see that she had instinctively ticked all the qualities above. Let’s take each of these qualities in this context. Transparent leaders allow their direct reports to give them feedback and respond as often as possible by making adjustments where needed accordingly. Transparent leaders will change as soon as they know they need to change and not hide the change. In fact, they’ll make sure the team knows and is thanked for their feedback. Transparent leaders are not hierarchical. But mostly, transparent leaders do not use whatever shade of truth that works best at the time. Rather they adhere to the most accurate and complete truth to the best of their knowledge. The fact that PJ Harvey had the courage to have this art installation demonstrates in itself her willingness to show transparency and truth. Over five weeks approximately 3000 strangers would have come to watch her and her team create an album. This was an incredibly brave thing to do and shows how confident she was in her own ability and with her team. Yet there were other occasions that she knew very clearly that this was her album. All leaders must make tough decisions; it goes with the job. They understand that in certain situations, difficult and timely decisions must be made in the best interests of the team; decisions that require a firmness, authority, and finality that will not please everyone. Extraordinary leaders don’t hesitate in such situations. They also know when not to act unilaterally but instead foster collaborative decision-making. It was interesting watching her gently but firmly insist on including another artist or instrument despite opposition. In leaders, humour and humility go hand in hand. They’re like a counterbalance for self-confidence, something that keeps their feet on the ground and their egos in check. Taking oneself too seriously can often backfire. On every visit that I made, I saw PJ’s sense of humour. It might be in reaction to something that someone said or a sudden wrong note played, but laughter in the box was prevalent each time. At the very last session a note was played too loudly. There could have been annoyance or irritation; instead we saw PJ and the team rolling with laughter. One of the most underrated qualities of a great leader is humility. While many leaders are focusing on casting a great vision, on working more efficiently on building teams and building membership there are quite a few that don’t look in the mirror. Realise you are not superwoman, create an environment of openness and accept criticism. There was one occasion when someone in her team told her that a particular song was awful. It needed to be removed from the play list. Was she going to be the pop-diva and insist that it remain or would she listen and respect the opinion of others in her team? We saw her walk across to her list of songs stuck on the wall and using a red pen put a line through one of them. It was the way she did it that was special. It was tongue-in-cheek with mock sadness. Funny, honest and full of respect for her team. Wonderful! In 2010, IBM’s 2010 Global CEO Study, which surveyed more than 1,500 chief executive officers from 60 countries and 33 industries worldwide, concluded that creativity is now the most important leadership quality for success in business, outweighing competencies such as integrity and global thinking. Recording an album is a creative process in itself but recording it as an art installation in full view of the public shows how experimental and independent a thinker PJ Harvey is. The mood was so relaxed and supportive – it encouraged creativity. One time, Flood suggested some heavy breathing to add to the music. A lot of musicians might balk at such an idea. In the spirit of adventure fostered by her environment, it was tried- amidst laughter- and it looks like the heavy breathing worked and will probably make it into the album. Leaders use intuition to read people: intuitive leaders can sense instinctively emotional changes in the work environment. Intuitive leaders can sense rising stress levels; they can sense when a member of their team is carrying a great personal burden, and they can sense when an appropriate time presents itself to make a meaningful connection. Talking to some of the musicians at the after-party, I was not surprised to hear their stories and how much PJ connected with them on a personal level. There are many ways to adapt to change. But one that is readily available is inclusion. In this case, inclusion means involving other members of the team. By doing so, leaders supplement their own set of skills and abilities, they use the insights of their team members to identify the problems and they draw on the strengths of their team members to find the best solutions. The entire process of making the album is a collaborative process. PJ was constantly questioning and listening to her musicians to arrive at the best result. What makes a leader inspirational? The ability to inspire people to reach great heights of performance and success is a skill that leaders need. Passion, purpose, listening and meaning help make a leader inspirational. The ability to communicate that passion, purpose and meaning to others is what is needed. At the after-party, talking to all the team members the same points were repeated again and again. The feeling of respect, being inspired, believing in PJ Harvey’s vision and feeling part of it. All the musicians are hugely talented and lead very successful independent careers. Yet they all put their egos aside, joined a team that some of them had never met before and worked in the glare of the public eye for five weeks. Why? Very simply because of the leader. 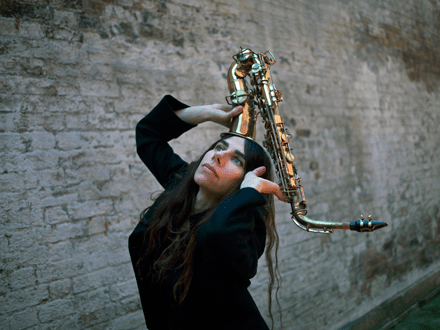 PJ Harvey is not just a double Mercury prize winning singer/song writer. She is a woman who can show leaders around the world what it takes to be a successful leader. How many leaders do you know who could pull in a team from around the world and start and finish a project while being watched by strangers? A project that must have fun, laughter, innovation and focus. A project that must be completed in five short weeks and a project team that comprises entirely of men being led by a woman. I look forward to hearing the album when it comes out next year. It will be a reminder of what great leadership can achieve. Really enjoyed your article Smita, thank you. Great insight giving an interesting and different angle. Just goes to show that leadership is all around us in the not so obvious places.